So you're visiting Virginia. Will Richmond International Airport give you the cheapest, best flights? Dulles? Norfolk? As always, it depends on your individual circumstances. Keep reading for my favorite Park-Fly Deal hotel! Who is this guy, why does he have a bucket on his head, and what does he have to do with Virginia airports? See below. I'll also give you links to air travel tips, including traveling with kids, airport security rules, and how to make your flight a breeze. I'll start with the most central airport for visiting Virginia. Why do I love Richmond International Airport? Even before we moved to Virginia, Richmond International Airport (I'll sometimes refer to it by its acronym, RIC) was our favorite. Having lived in California, New York, and Detroit, Michigan, and having to deal with the huge airports there, RIC was a breath of fresh air. In fact, whenever I fly back into RIC, it's such a relief (especially after flying through the zoo known as LAX) that I ALWAYS say "I LOVE this airport!" Moderate-sized, easy to get to, and virtually never crowded, Richmond is a pleasure to fly in and out of. That by itself would be reason enough for us to choose it as "our" airport over Washington, DC's Dulles International Airport, even if RIC weren't closer. After all, you don't want to start your vacation stressed out because of a congested airport. Yes, you may be more likely to get cheap flight deals at Dulles, but you'll pay for it with longer lines, dealing with DC traffic, and potential parking headaches. Plus, RIC is more central to Virginia Beach, Williamsburg, Busch Gardens Williamsburg, and central Virginia. So unless you're planning to spend part of your vacation in Washington, DC or northern Virginia, I don't recommend Dulles. Go with RIC or Norfolk International Airport or Williamsburg airport. Speaking of Norfolk, that's where my brother-in-law, John (alias Bucketman) prefers to fly in to. He lives in New York and is always looking for late evening flights that get him as close as possible to my in-law's house in Smithfield (just over the bridge from Newport News and Hampton. So Norfolk works best for him. 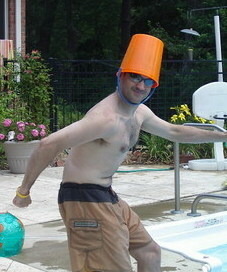 That's a picture of him above from his visit last summer, pretending to be a superhero called "Bucketman." Our kids love it. Do you want to know tips for getting cheap flights? Click here for my air travel tips. Richmond International Airport is located seven miles southeast of Richmond, the Virginia's capital. It's less than an hour drive from Williamsburg and a two-hour drive from Washington, D.C., the Blue Ridge Mountains, and Virginia Beach. Next to Dulles, it's the largest airport in Virginia. Whichever direction you're coming from, it's hard to miss. From the West (Richmond and Charlottesville): Take I-64 east to Exit 197A (Airport Drive). Or, take I-295 east to Exit 31. From the East: Take I-64 west to Exit 197A; or take I-295 west to Exit 31. From the North: Take I-95 south to I-64 east to Exit 197A. Take I-95 south to I-295 east to Exit 31. From the South: Take I-95 north to I-64 east to Exit 197A. Take I-95 north to I-295 east to Exit 31. Click here for a Google map of the airport.